The government, which controls 82% of RBS, has for months been negotiating with Abu Dhabi sovereign wealth funds. It could sell up to a third of its stake to Abu Dhabi, one of the seven states of the United Arab Emirates. This is likely to to be a loss-making sale, as RBS shares trade at much less than the UK government paid in 2008. In 2008-9, the UK government invested £45.5bn of taxpayers' money in RBS, to prevent the bank from collapsing. RBS was close to running out of money after its near ruinous takeover of ABN Amro. The Treasury bought the RBS shares at an average of 50p each, almost double the current share price. The news that it is in serious talks with Abu Dhabi to sell a sizeable portion of the bank at a loss will come in for vocal criticism - not least of all at a time of austerity. The deal could see at least 10% and up to one-third of the government's stake sold. At current prices, it would mean that taxpayers could potentially suffer losses of £1bn for every £2bn paid by the government. However, the selling of part of the bank could stoke further private sector interest in RBS and push up its share price towards break-even point. It would also send a clear signal to both the markets and RBS staff that the government does not want to be a long-term owner of a major bank. A Treasury spokesperson told that the BBC that the government's aim was "to repair and return RBS to full health so that it is able to support the UK economy in the future, and the current strategy is working to achieve that". "The government's policy has always been to return RBS to the private sector, but only when it delivers value for money for the taxpayer," the spokesperson said. Another advantage of a deal for the government is that it could deflect political pressure in the run-up to the next contentious bonus season. The government could then argue that major decisions, such as executive pay, were no longer just up to the Treasury and UK Financial Investments (UKFI), which manages taxpayers' stakes in financial institutions including RBS, Lloyds Banking Group and Northern Rock Asset Management. While no deal is imminent, the government hopes that one can be agreed before Christmas. The news comes a fortnight after Jim O'Neil from UKFI told MPs on the Treasury Select Committee that it would consider selling a portion of RBS at a loss. 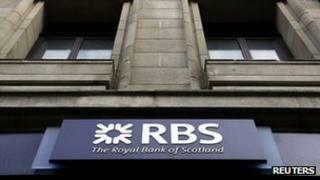 RBS has so far declined to comment, but senior managers are likely to welcome the government selling a stake. The bank has been subject to intense public and political pressure over pay and bonus levels of its senior management. Its chief executive Stephen Hester turned down a share bonus worth almost £1m after a public campaign and the threat of a House of Commons vote on the issue. And RBS bosses are also likely to be keen on the idea as most of their remuneration is in shares, which have remained in the doldrums since the near collapse of the bank in 2008. A spokesperson for RBS said any possible sale of the government's stake was "a matter for UKFI and the board of whatever company is thinking of buying shares in RBS". Finalising the deal could take at least six months, because of concerns on the government's side. The coalition knows that it will face a furious backlash from many quarters, not least of all from Labour, for selling a sizeable part of the bank at a loss. Add this to the sale, also at a loss, of Northern Rock to Virgin Money and the coalition will be open to the charge of giving away the family silver. And then there is the plan floated by Business Secretary Vince Cable to break up RBS and turn part of it into a dedicated business bank, lending to those small and medium-sized enterprises (SMEs) that struggle to get credit from other lenders. If the sale of a sizeable stake to a sovereign wealth fund proceeds, Mr Cable's idea is less likely to ever materialise. Abu Dhabi has the largest sovereign wealth fund in the world. According to an estimate by the Economist it is worth about £550bn ($875bn). Between its various investment funds, Abu Dhabi has bought stakes in a number of companies including Daimler, Virgin Galactic and the Mercedes F1 team. Sheikh Mansour, a member of the ruling royal family in the UAE, owns the football club Manchester City. In late 2008, Abu Dhabi invested £1.2bn in Barclays when the British bank, like so many others, was on the verge of collapse. It doubled its investment as Barclays recovered and has since sold most of its stake at a profit. More recently the investment company Aarbar, controlled by the Abu Dhabi government, took a notable stake in the struggling Italian bank Unicredit at the start of the year, which has jumped by a third since then. Abu Dhabi has a good reputation for corporate governance in those businesses in which it has invested, is not known for meddling in the day-to-day running of those companies and has yet to have a high-profile clash with managements or boards. Follow Joe Lynam on Twitter -BBC_Joe_Lynam- and watch his full report on Newsnight on Monday 26 March 2012 at 2230 on BBC Two, then afterwards on the BBC iPlayer and Newsnight website.